You invested time and money to hire that new employee. How does it go on the first day? It matters. Employee onboarding is a critical component to employee engagement and experience. And while management thought leader Tom Peters suggested during this #CIOChat that “there should be federal legislation outlawing the wretched term onboarding,” onboarding is something that really matters to your overall employee engagement. A 2017 Gallup Research showed that only 12 percent of employees strongly agree their organization does a great job of onboarding new employees. CIOs believe that onboarding is an organization’s second impression after the interview. It's a tone setter. It's an enabler of greater employee impact. CIOs suggest that optimizing the costs here is a race to the bottom. Being great at onboarding great talent is a strategic. It is an intentional act that is worth spending more rather than less. Importantly, CIOs suggest it can be the beginning of the end if it's handled poorly. CIOs say good people can be immediately turned off by a bad onboarding process. CIOs suggest that onboarding is a combination effort of HR, the hiring group, and representatives from key line of businesses. It's a "whole." The cost of doing it poorly is “opportunity lost.” CIOs say onboarding is effectively a “user experience” and critically important today. They believe that too often onboarding is treated almost as a “haphazard hazing exercise.” As with most things, you only have one chance to provide a first or here, second impression. CIOs believe that onboarding should be planned, mapped, and performance for it regularly checked. The business costs for doing it poorly include delayed productivity, disengaged employees from the start, and churn. In today’s world, CIOs say, that there is no business if a company is executing onboarding poorly. What is the business impact from a poorly managed employee onboarding process? On the other hand, CIOs suggest a good on-boarding process makes staff feel valued from their first day. Especially, if you move someone from a job to having purpose and an effective extended family. A good onboarding process ensures employees have a good experience from the start. CIOs believe that investing in a great onboarding process really has limited risk versus the not investing in one. CIOs, in fact, believe the business impact is bigger than most realize. Organizations with structured or formalized onboarding programs can see a 60 percent year-over-year improvement in revenue. New employees can provide bandwidth, energy, ideas, skill — all of which can become muted when their onboarding process is poorly designed. CIOs suggest that a good onboarding process should start during the application process and ideally go even longer than most organizations imagine. It should become in the later phases proactive talent management. CIOs suggest that organizations go and get the people they want and need. And they shouldn’t wait for them to apply and be transparent on the job. How many internal and external processes and systems need to be touched to onboard a new employee? Is there a business cost to this? CIOs say that the onboarding process should be personal. They say that account provisioning processes behind the scenes need to be automated and seamless. CIOs believe that the emphasis, however, needs to move from logistics to engagement mechanisms the minute an offer is accepted. Yes, benefits sign up and I9s are necessary. However welcoming, including, and engaging have long term value. CIOs believe that “employee onboarding” is, for this reason, “user experience.” A key aspect of improving this user experience is to enable the internal teams that form the first stop for new hires – the HR partner and the hiring manager, full visibility into the new hire’s onboarding status. Whether it is delayed corporate credit card delivery or a late access to a critical application, the experience of the new hire can be better managed when internal champions responsible for onboarding have better visibility into the latest status. CIOs stress that there are clear business costs from executing onboarding poorly. The degree of automation varies between CIOs; most often corporate systems’ access is provisioned automatically, but business-specific and edge systems may have their own provisioning. Is there a business service for provisioning new employee systems and system access? Some CIOs suggest that there are processes that need execution, but there are also people practices that need execution: Are people welcomed? Do they get introduced around? Do they get a "cheat sheet" to bring them up to speed? Do they have mentors? Hiring organizations clearly should own the first touch. CIOs believe that there should be high touch welcome to the working group! Many successful organizations looking to improve the onboarding process typically send an email in the week leading up to the start date with helpful videos and tools that make the new employee excited about starting at this new job, make them familiar with the company culture, and assuage any anxiety they might have about the change. Some CIOs suggest a welcome message that is sent to all staff, a personal welcome from leadership and investigation of a "welcome kit." CIOs, also, like to assign a buddy to help the staff member learn about the organization. Finally, it may seem hokey, but company branded stuff is nice for a new employee in their welcome kit. CIOs think some personalization is a great touch. They say after all is it a just a place to work or a family? 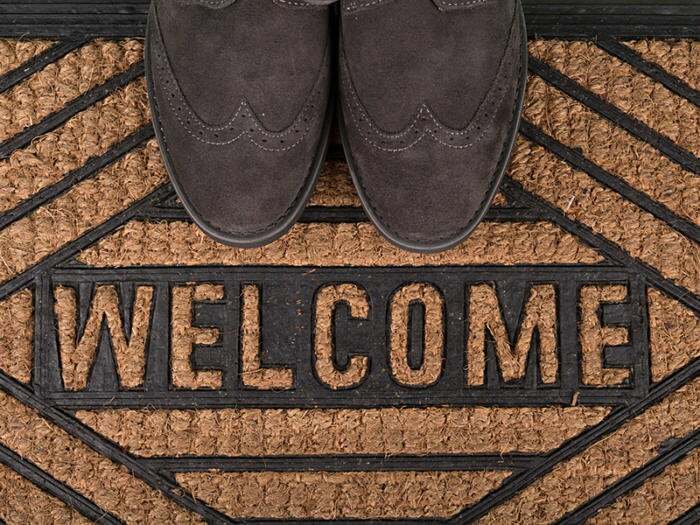 Most CIOs say that a personal welcome matters. One CIO said that they meet each new employee and I've been told several times that it's unexpected and appreciated. Another CIO said that they have instituted "CIOs in Conference Rooms Getting Coffee." Virtually all, CIOs believe they should meet new team members during their first week. Many, also, think it could be good to meet again 4 to 6 weeks later to hear their experience and any blind spots or trouble areas they’ve noticed so they can take advantage of their fresh eyes. CIOs suggest as well it's very important to be ready when new employees are onboarded. They say it’s a tough thing to do well. One CIO said that they have automated process for much of Tier 1 systems access. But they believe that as a goal it should be automated and seamless from end to end. Making an employee feel valued is the key to engagement—a great onboarding experience from top to bottom demonstrates how valued a new team member is. This is why making online systems work even better make so much sense. HR is the lead with IT as a critical partner. How well connected are HR and financial processes for onboarding or does someone still have to manually link data across processes? One CIOs joked that CIOs run perfect shops where there are no disparate systems or integration needs. They said that reality is that it is an ongoing struggle to make real as systems change. Other CIOs said that their companies financial and HR are mostly tied together. Gaps in a few areas still exist. They said interestingly that this is especially the case if you have remote staff or staff that travel. Nevertheless, CIOs believe these should be fully integrated. Most CIOs still have manual processes to define the applications the new colleague should access. CIOs believe employees are part of your "system." If an employee isn't efficient in getting started, it drags on the system. Speaking financially, every day a new employee isn't fully productive is lost opportunity. On a human level, not cementing a positive connection is a huge risk. Currently, strengthening these integrations and links...in the past if was mostly manual and not really repeatable effectively. One company that has succeeded at fixing things here is Moderna. If you could reimagine employee onboarding, how would it work? CIOs would change many things. CIOs would like to start with the ability to do a great job of closing the deal by offering a really competitive salary that makes the new employee feel valued. Then, they would like to make the process as seamless as possible...beyond HR and finance to include things like parking. After this, they said they would like the technology ready before day one. They want a welcome packet, Swag, and the workspace prepared. Additionally, the onboarding team should be available for questions. They would also like mentoring available for first month or two. At the same time, they say leaders should ask for feedback throughout. It is great to provide leadership meetings or letters. Some CIOs suggest that there should be more active involvement in the improvement and fit of the new employee. And onboarding doesn't have to stop right after someone is hired. CIOs said that you'd think that the company bottom line would cause managers to want new employees productive as quickly as possible. With all of the talk of improving the user experience in other contexts, you'd think we'd pay attention to this context. An old but apt saying "If we train them, they might leave" at which point the smart leaders says "and what happens if we don't? CIOs said that the excitement of the new job dies quickly if you're not feeling comradery every day. Being employee-centric, frictionless, allows for individuality-at-scale, lays groundwork for long term retention and success. It should involve automating the mundane so it can drive employee engagement from the start. This is a big change, but onboarding sets the tone and can determine the longevity of a relationship.